in Birthday· Lean Luxury· Things that Spark my Interest· What Am I wearing? In case you didn’t know Brits have been celebrating the Queen and pondering what she means to us all after ruling for 60 years. When I think of the Queen amongst other things I think of crowns, tiaras, broaches, 3 strands of pearls, jewels – big jewels – and lots of them! 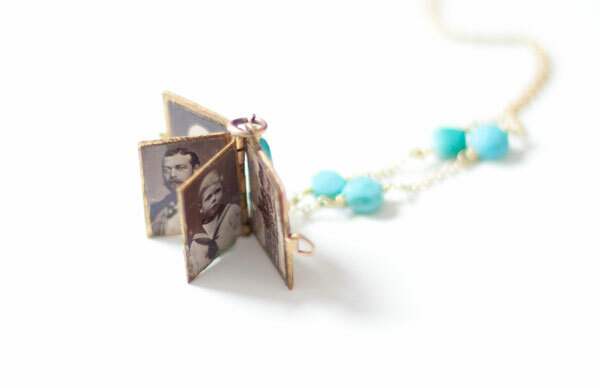 Each piece has a history. One of Minty’s favorite activities is to go through my jewelry box – which turns out to be a trip down memory lane for me and an education for her. A delicate gold bracelet I inherited when my great-grandmother died, the Venetian butterfly broach given to me by my grandmother from one of her many trips to her beloved Italy (I wore it in my hair for my wedding as my something blue), the pearls I wore to the Passage to India premiere, the jade Jensen ring from a friend on my 21st, the enamel teddy bear I made at Washington Cathedral school during my school exchange trip and the silver penknife from Tiffany (a first birthday gift from my husband, then boyfriend). 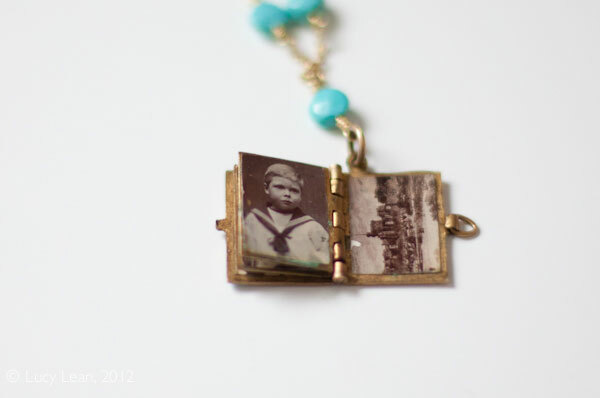 All these treasures hold memories beyond their monetary value that make them priceless. We pick out an item and discuss its history – who gave it to me, who it might have belonged to before, if there’s a significant date when it was given to me. I realized this last weekend I do have my own, albeit small, crown jewels and many seem very appropriate to share as a tribute to the Queen. 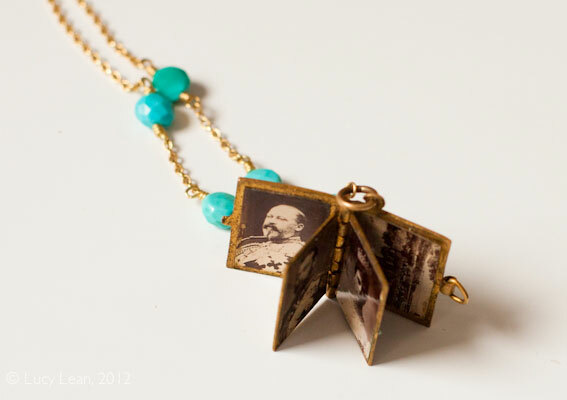 My hubby gave me this necklace when we lived in New York. It was made by my friend Annabelle Maguire – she made the most beautiful jewelry, the earrings I wear every day were hand cast by her. At one of her sales I saw this piece and fell in love with it. I came back minutes later to tell her I wanted to buy it only to find out it had already been sold. I was heartbroken. Little did I know my husband had already purchased it for me. 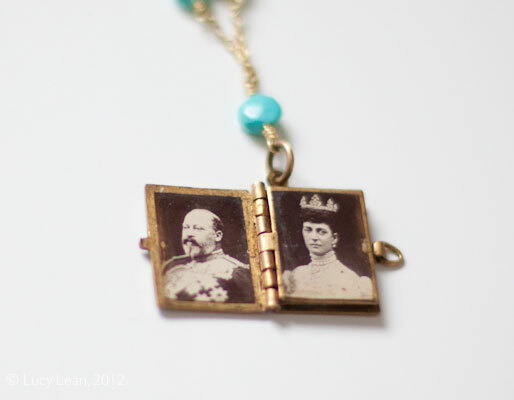 It’s a tiny photo album of the royal family from around the time of the coronation of King Edward VII in 1902 – he was the son of Queen Victoria and is the first of the portraits in the book and on the opposite page his wife, Queen Alexandra. The Edwardian era, the first 10 years of the twentieth century was a period of great change in the arts, sciences and socially – I would love a time machine to go back and enjoy this period first hand. 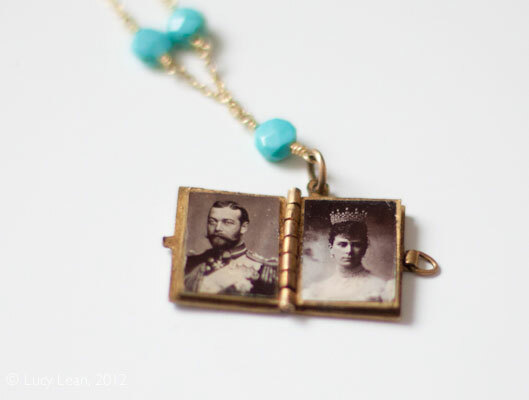 The next photographs are of King George V (grandson of Queen Victoria and grandfather of Queen Elizabeth II) who married Mary of Teck, Queen Mary. Interestingly, she died a few weeks shy of Elizabeth’s coronation in 1953 – at this time there were three living Queens – Queen Mary, Queen Elizabeth (the Queen Mother) and Queen Elizabeth II. The final portrait shows His Highness Prince Edward of York, who would later become King Edward VIII and then abdicate to marry Wallis Simpson. The final photograph shows Windsor Castle, King George V founded the House of Windsor in 1917 due to the anti German sentiment from the British people during World War I, they were previously called the house of the German Saxe-Coburg and Gotha which came about when Queen Victoria married Prince Albert. This little book was put together long before the little boy in the photograph would be granted the title His Royal Highness the Duke of Windsor, post abdication when he gave up his crown for the women he loved. 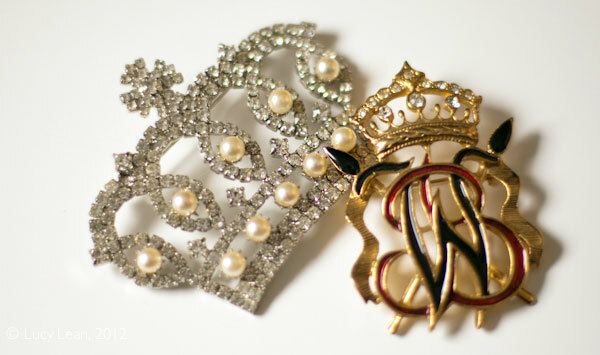 I have several crowns in my dressing up box – these two broaches were made by Butler and Wilson long before it crossed over to QVC – the one on the right was given to me on my 21st birthday by my boss at the time, John Cigarini, when I worked at B.F.C.S. I believe it was made to celebrate the 21st anniversary of Butler and Wilson that was being celebrated at that time – it came in a box as the invitation to the party. 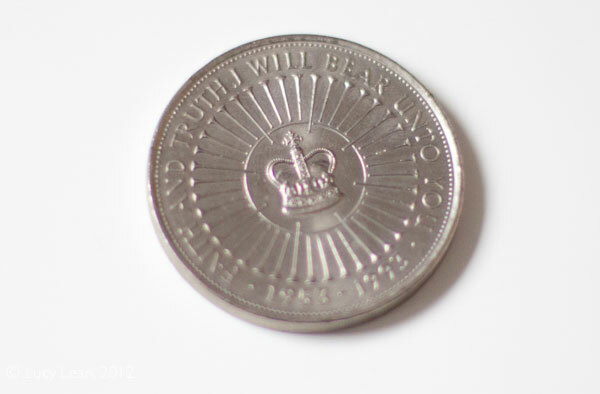 Okay, so this coin isn’t jewelry but it is part of my treasures, I have a large collection of souvenir coins in my jewelry box – £5 coins to commemorate every significant event in recent history mostly given to me by my father who began the tradition when I was a child, the silver jubilee, the wedding of Prince Charles to Lady Diana Spencer, thirty years since the coronation (above and below), the Queen Mother – can’t remember if this was reaching 100 or her death, Sir Winston Churchill (given to Rémy when he was a baby), the Golden Jubilee and many others. 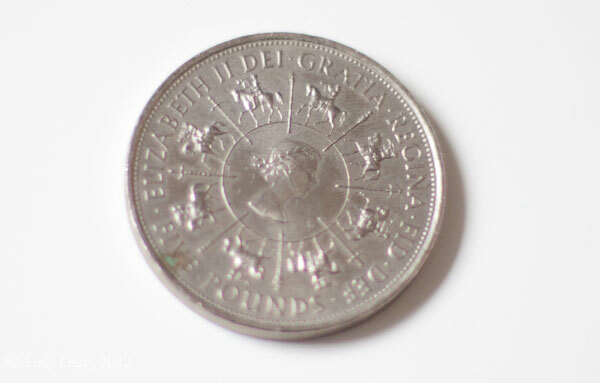 I’m hoping Daddy has remembered to get me a Diamond Jubilee coin. 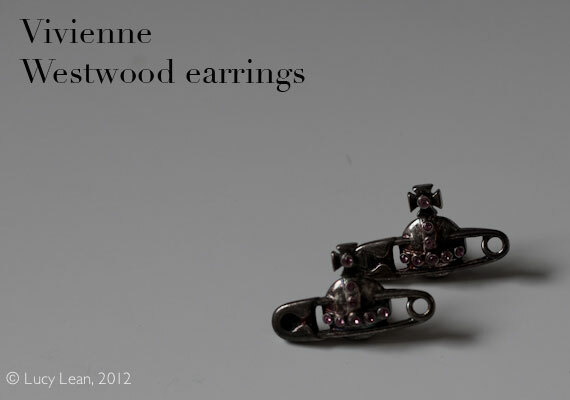 These Vivienne Westwood earrings below were given to me by my fabulous friend Jac – who is so hip and on the money I wish I was more like her. She once took me to Boy George’s birthday party with two of our fellow BFI classmates dress in drag. I love this mix of punk rock with the safety pins going around the orb. 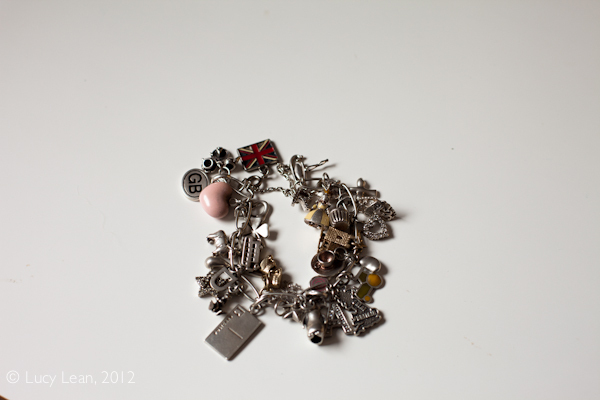 Finally, perhaps my most beloved piece is a vast collection of many pieces that I have on my charm bracelet. 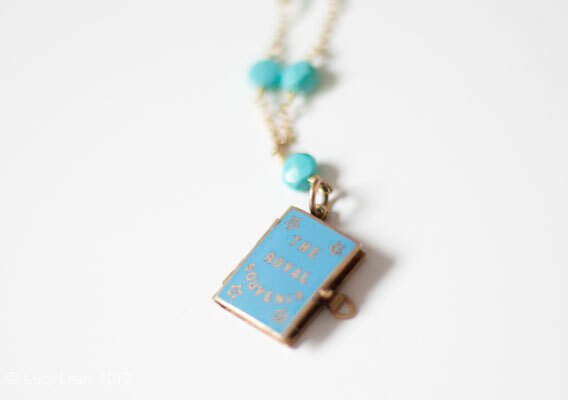 It is so precious to me and holds so many meaningful charms to mark moments in my life I would be devastated to lose it – that said I’m a great believer in not storing things away in cupboards for a rainy day and will definitely wear it more often. Gold: baby booties, church which you can open to see a bride and groom, L which caught on everything so I had the jeweller cut off the bottom and made it into an I! Silver: D, London Bus, cup of tea, cupcake, four leaf clover, teardrop, postcard, map of the UK, sheep, GB, teapot with cup and saucer with a slice of cake, snowflake, penguin, bean, bird and half of big sis (the other half I gave to my sister and it reads lil’ sis). A beautiful post. Thank you for sharing some of your treasures with us. The necklace you husband gave you is exquisite! Such a warm and heartfelt post. Thank you for letting us peer into your memories and for sharing your experiences with us. I loved hearing this story! What a great collection!